Successfully Added Peephole Camera and Security Camera (Sharp CCD, Wide Angle, Pal) to your Shopping Cart. 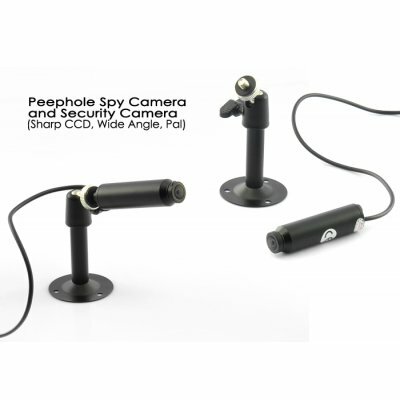 New 2-in-1 Peephole Camera and Security Camera with a Sharp CCD and Wide Angle lens. Stick this high quality peephole camera outside your door and from the inside, you can connect the camera to a DVR or TV and see exactly what’s happening outside - all without leaving the comfort of your chair! You’re watching a movie with your girlfriend and it’s getting good while suddenly the door bell rings! Instead of guessing who it could be, simply look at your TV monitor to find out it’s a prank and nobody’s there, then continue with what you were doing! Simple in design, but extremely well built, this high quality camera allows you to easily place it within most furnishing including cabinets, doors or ceiling. Even better, with the base stand (included), you can fix the camera in anywhere of your room or office to act as a mini security camera. Thanks to the high quality Sharp CCD lens, you can also allow see objects with excellent clarity and at a 175 degree wide angle view. Ever think people are lurking around your house or messing with your garden or other parts of your house or lawn. No longer do you need to be paranoid about this happening. A peephole Camera is a great way to know for sure exactly what is happening outside of your front door, even while you’re away. Whether used as a hidden camera or as a standard security camera, you cannot go wrong with this 2-in-1 device, especially at this below wholesale price. It is in stock right now for single piece or bulk purchases. Order yours today from the leader in factory-direct from China wholesale electronics - Chinavasion!